Don't Know What Fire Rated Letterplate You Need? 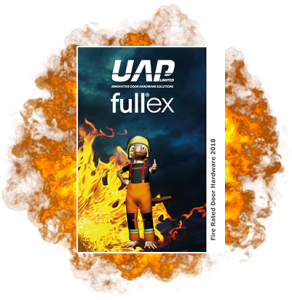 At UAP, making sure that our fire rated door products are tested to and exceed the latest fire safety standards is a top priority. Each of our fire tests are carried out by a third party test house, and all of our fire rated products have third party accreditation. Some of our letterplates have also been tested to Certifire standards. Recognised by regulatory authorities around the World, Certifire is an independent third part certification scheme that assured performance, quality, reliability and traceability of fire rated products, and is a Internationally respected mark of fire safety. 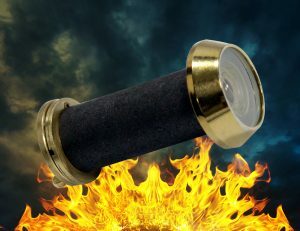 Each fire check letterplate is lined with a special intumescent material which expands to 50 times its size, blocking the hole in the cavity and preventing smoke coming through the cavity. The intumescent is activated at 5 degrees lower than most other intumescent material in the market, meaning that the cavity will be blocked quicker. 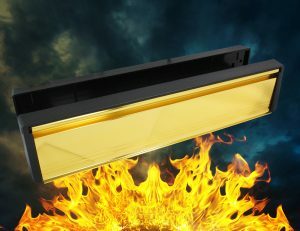 The letterplate also uses special heat absorbers which stops the screws, once they are red hot, melting the plastic around then and causing the letterbox to fall off. This in turn helps prevent a fire from spreading onto the door for up to 1 hour. 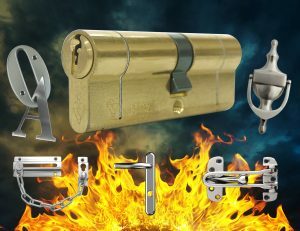 Fire resistant door viewers offer incredible value for money. Each view is FD60 60 minute fire rated, and has been awarded the prestigious ‘Secured by Design’ seal of approval from the Association of Police Officers, as well as complying with the most stringent and regimented of DHF TS 01:2009 standards. Comprising of a solid brass body and 3 Pyrex glass lenses, each viewer is ensured to give crystal clear performance for years of safe, secure, use.